During his freshman year at Auburn, in 2007, Neil Caudle’s mother, Teresa, was diagnosed with breast cancer. She underwent treatment and is now cancer free. Photo courtesy American Cancer Society. Neil Caudle has little pink in his wardrobe, but that’s going to change next month. The former Spain Park and Auburn University quarterback will take part in the American Cancer Society’s Real Men Wear Pink of Birmingham fundraiser during February. “When I wear pink, I’m breaking a (wardrobe) rule,” Caudle said with a laugh. Caudle can thank a relative for his upcoming pink attire. Real Men Wear Pink is a campaign that gives men a leadership role in the fight against breast cancer. Community leaders are hand selected to be “Real Men” and stand at the forefront of the fight against breast cancer. The requirements to be “Real Men” call for them to wear pink in February, set a fundraising goal of $2,500 or more, fundraise for bragging rights as Birmingham’s Pink Man of the Year and post on personal social media to raise awareness about breast cancer. Otherwise, all they have to do is have fun and enjoy the friendly competition. The 2017 Real Men Wear Pink campaign in Birmingham raised about $137,000. Every dollar raised helps the American Cancer Society save lives from breast cancer through early detection and prevention, innovative breast cancer research and patient support. The goal for 2019 for the Birmingham area is $130,000. More than 20 men in the Birmingham metropolitan area have agreed to take part in next month’s campaign. Like many of those participating, Caudle’s life has been touched by cancer. During his freshman year at Auburn, in 2007, his mother, Teresa, was diagnosed with breast cancer. She underwent treatment and is now cancer free. Caudle graduated from Auburn in 2011 with a degree in building science. 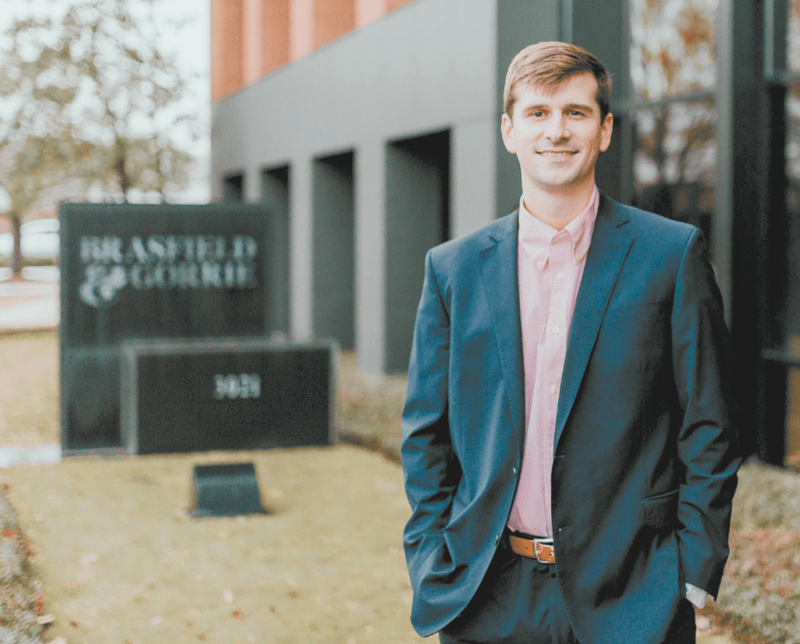 He’s now a project manager at Brasfield & Gorrie, a construction firm headquartered in Birmingham. Caudle was part of Auburn’s 2010 national championship team and was the holder when place-kicker Wes Byrum booted a field goal to give Auburn a 22-19 win against Oregon in the national championship game in Glendale, Arizona. While he has fond memories of that game, Caudle has moved on from being a player. Caudle is too busy being a husband and father. He and wife Emily have three children, 2-year-old twins Joe and Kate and 1-month old son Tommy. “My football now is throwing the football with them,” he said. Learn more about the campaign and donate to a participant’s fundraising efforts at cancer.org. Click on Get Involved, then Fundraise and scroll to the Real Men Wear Pink icon. What: The 2019 Real Men Wear Pink Kickoff party will feature an introduction of the “2019 Real Men,” hand- selected business leaders, that give a leadership role in the fight against breast cancer. The event includes hors d’oeuvres, a cash bar, live music and a bourbon auction. Special entertainment will be provided by The Hams. Guest emcees will be Will and Reed Lochamy from Oh Brother Radio. When: Thurs., Jan. 31, 5:30-7 p.m.